In Model 5 we will deal with the care of Prototypes and Sdifettament leaders. (Read more). 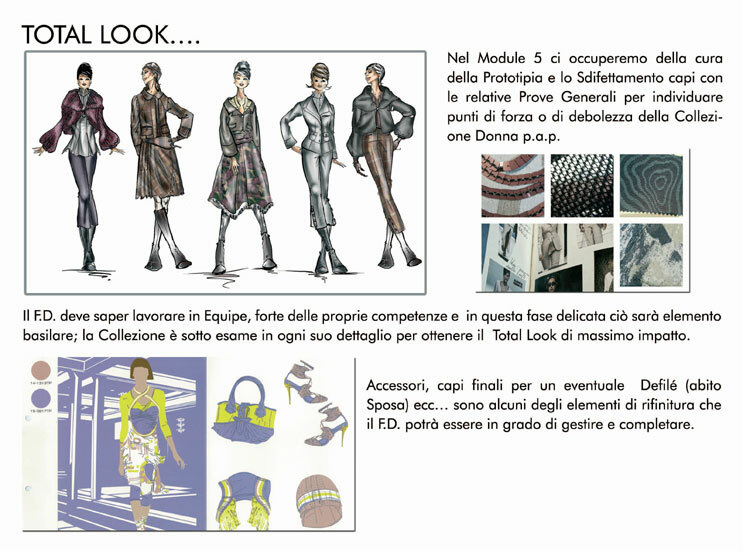 In Module 5 we will deal with the care of Prototypes and Sdifettamento leaders with relevant General Tests to identify strengths and weaknesses of the women's collection p.a.p. the F.D must be able to work in Equipe, the strength of its expertise and at this delicate stage what will be the basic element; the collection is being examined in every detail to achieve the maximum impact Total Look. Accessories, end heads for a possible Defilé (Bride dress) etc .. are some of the elements of finishing that the F.D will be able to manage and complete.